You have a product idea you want to take to market. Now what? Aspiring entrepreneur, tinker, engineer…Your mind runs 1,000 miles per hour thinking of the many different ways you can improve your environment. Just recently you have come up with a product idea that you know can benefit many different people. It’s worth a shot to try to develop it and take it to market — but how do you even start? If your idea is a physical product, this article is for you. We’ll walk you through exactly how to present your product idea to a design company — an activity that will serve as the beginning of the design phase of your project. You’ll read about the four components your presentation should include: the problem, the solution, aesthetics & price point, and the competitor overview. Next, you’ll find a section of do’s and don’ts based on some of our clients’ most-asked questions. and achieve an overall higher quality design. So if you think you might be ready to approach a design company with your product idea, read on. Our insight is based on more than seven years of experience helping companies, engineers, and entrepreneurs design innovative and successful products, and we’ve shared it with you so you can be prepared when stepping into the world of product development. When presenting your product idea, the first thing you’ll need to do is present the problem you’re aiming to solve within a certain market. We have many different types of clients from many different industries. Some are first-time entrepreneurs who have never sold a product before — and others are international companies who’ve created and sold many different products. All of them come to us because they want to make a product that helps improve people’s lives — it’s their way of providing a solution to a meaningful problem they have encountered. Coming up with solutions can arise from brainstorming ways of fixing a problem or just looking at existing products to see how you can improve upon them. For example, you could look at a product you have at home or at work and examine aspects such as difficulty of use, loudness, weight, cost, ergonomics, battery life, and so on. In order for innovators to know that there’s a problem to solve, however, they must have gained some market insight. You can gain market insight from firsthand experience, by reading product descriptions and reviews, or by talking to people who work in a specific field or industry. Market insight case study: Let’s say you’re a tech-savvy parent, and you work from 8 a.m. to 5 p.m. Monday through Friday. Your son comes home from school at 2:30 p.m. every day. He has a key to get in the house, but one day while you were at work, he called to tell you that he lost it and couldn’t get inside. In order for him to get into the house, you had to leave work, drive 20 minutes to get home, then open the door for him and go back to work. That night, you thought about getting a keyless door lock to avoid any future problems with lost keys or not being able to give someone access to your home remotely. 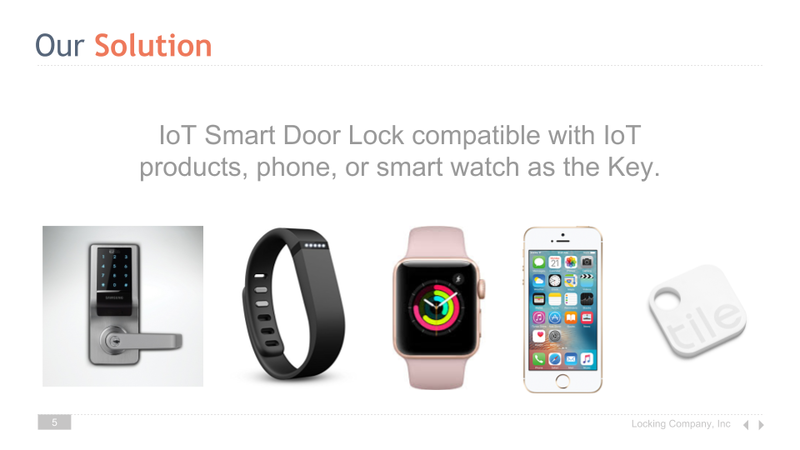 You looked online for a smart door lock that would be efficient and easy to use, but they were all too expensive. 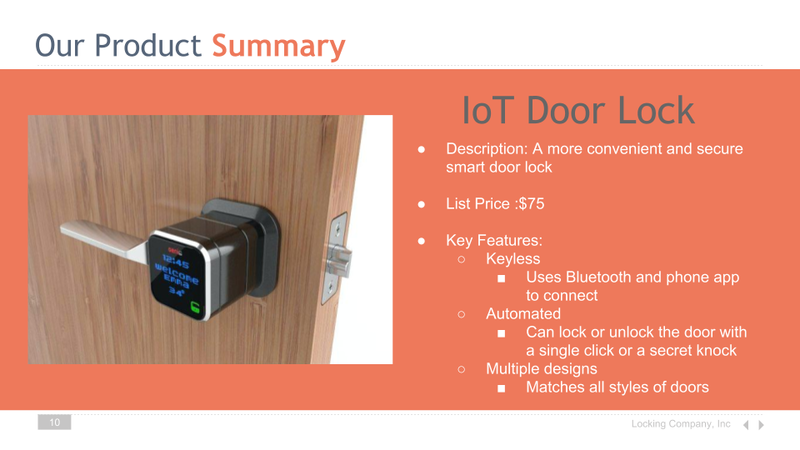 This led you to consider producing an affordable IoT door lock. 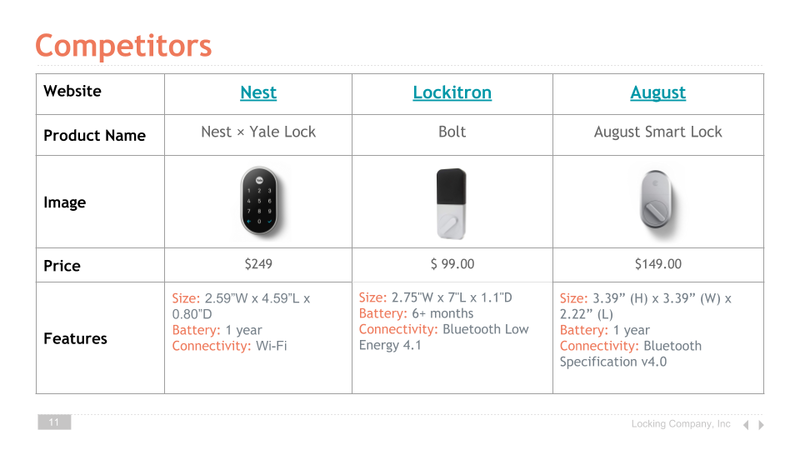 If you never had to leave work to open the door for your son, you wouldn’t have come up with the idea of making a smart, low-cost door lock that solves the problem of losing the keys.This is the kind of insight that will help you dig deeper into understanding the market for your product idea. Tip: Use a business model canvas or a business plan to help you gain market insight. One way to become more familiar with your market is through the creation of a business model canvas, which is a simplified version of a business plan. While a business plan can be long and time-consuming to write and maintain, a business model canvas is much shorter and can be easily revised to adapt to changing business needs or direction. If you already have a functioning company, then you probably have one of these. If you’re just starting out, you may want to begin writing one. You don’t need to have a business model canvas or plan before you approach a design company with your product idea, but if you really want to sell your product in the future, we highly recommend having one. These documents can help you arrive at a better overall product because they involve research that will help you determine the problem you’re trying to solve. Perhaps more importantly, they’ll help you arrive at a better solution, and will assist you in understanding the features your product should include and the retail price point you’d like to meet — all information you’ll read about next. After you establish the problem, describe the solution (aka your product) and the features it should include. Some of our clients come to us with sketches that show how they would like their product to be. They already have an idea of what they want — regarding its aesthetics, function, and features — they just need someone to design the solution for them. But you do not necessarily need to have a solution before creating your presentation. Sometimes, when clients think about a problem in detail but are unsure of how to solve it, they might decide to work with a product design company like Jaycon to help them solve it. Include sufficient imagery and/or a thorough verbal description: Pictures are worth a thousand words, so make sure you include them to help describe your product. For example, if your product has a snap-on feature, include a picture of that — maybe you have a specific kind in mind. Describe how the product will look, feel and function. If you don’t have a specific solution in mind, describe the features you’d be looking for by including examples from competitors. Prioritize your features: It’s helpful if you prioritize your features on the basis of importance. If you’ve just begun working on this project, you may not yet know which features are most important to the end user — and having too many features right off the bat could get costly when developing a product. That’s why you should start by selecting only a few to focus on. If your product’s main desirability factor over a competitor’s’ product is something hands-free, then that would be your priority feature — the other features then become secondary. Cover both functionality and design: In addition to describing how your product will function, describe how you’d like the product to look. Understanding the style you’re going for will help guide industrial designers to come up with relevant concepts for your product’s appearance. If you’re envisioning a vintage design for your product, we need to know that so we don’t strive for a futuristic look. Tip: Create an MVP. Because you may not know which features will make it to the final version of your product, it’s a good idea to create an MVP, or minimum viable product, to test the main functionality of your design and gather feedback from potential users before you create a prototype. An MVP is a very simple version of a prototype that costs much less than a full-fledged prototype. Creating one will help you understand what features matter most to your final users so you can allocate resources only to what is relevant. 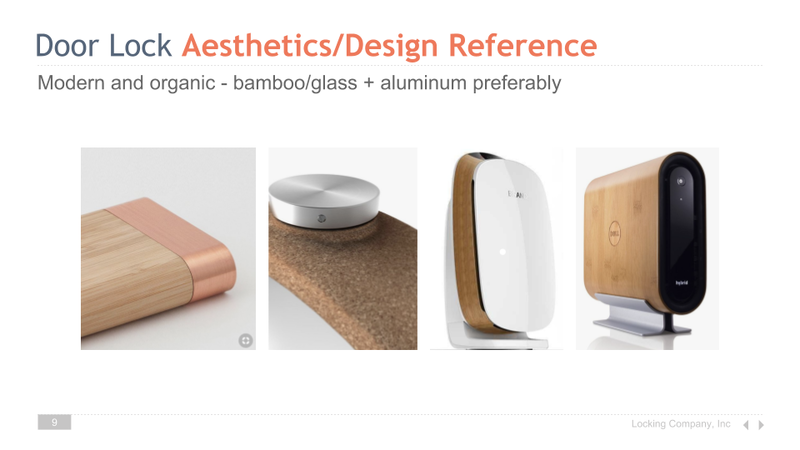 This part of the document is where you include any aesthetics inspiration and the retail price point you’d like to sell your finished product for after it has been manufactured. Also, include a brief product summary, providing a list of bullet points that summarize the features you’re looking for, along with any pricing brackets or tiers in case you have more than one variation of a product. The purpose of the summary is to leave your design firm with a “conclusion” that offers an overview we can quickly reference. The price point is important because it allows us to gauge how to help you prioritize the features and how many to include. Tip: Design costs, manufacturing, and retail prices are three separate things. Don’t confuse the desired retail price point for your product with what is going to be charged for design or prototyping. We design, but we also manufacture, so it’s common practice for us to apply design for manufacturing (DFM) principles during the design phase in order to achieve a certain manufacturing price point. The desired retail price point will allow us to be more daring or conservative with certain features. For example, adding very sharp corners in a plastic product will increase the cost of the manufacturing compared to rounded corners. That’s mostly because the tooling used will now have to go through a special process called EDM, or electrical discharge machining, which can cost almost twice as much as regular tooling. Depending on the requirements and price point of the product, we can decide whether or not to include sharp corners during the design phase. Information on competitors is important so we know what range of products we’re trying to improve upon and how to achieve that without reinventing the wheel. With some research, we can refer to competitor products and cut R&D costs and time by using reverse engineering. We can also look into their online presence and read product reviews to see what customers are unhappy about that we could address. Relevant technological features, such as power consumption, battery life, temperature range, highest audio volume, etc. Unique selling points (USP) — note here whether a competitor’s product is low cost in comparison to other products on the market, has remote capabilities, is lightweight or portable, has automatic shut-off, etc. Here’s a quick list of do’s and don’ts based on some of the most commonly asked questions and comments from our clients. Use a publishing software you feel comfortable with when creating your presentation. Clients have presented their ideas to us in many different formats. There’s not one correct way, but all good presentations do have the sections we described above. All in all, the vehicle for communication doesn’t matter as long as you clearly state the information you need your design company to know. In our experience, Google Slides, the free version of Powerpoint, works well, but you can choose whichever program works best for you. Include as many visuals as possible. The more visuals you have, the better — but not just for the sake of having pictures. Visuals help us understand your idea, so be sure to include pictures of competitor products and key product parts or features that you want to improve. If available, include pictures of competitor products in action. Limit the amount of text you include. You can convey some details and explanations in the notes section of the presentation, but don’t make it too text heavy. You should have the opportunity to converse with the company about the presentation and you can go into more detail then. Have a meeting to discuss your idea and your presentation. You should always have an in-person meeting, a phone conversation or video chat to discuss your product idea and the corresponding presentation. Don’t try to discuss your presentation via email or any kind of messaging system. If someone is local, we usually sit down in a meeting with a prototype they’ve produced or a competitor’s product. A lot of our clients are from out of town, though, and if they are, we’ll do a video chat or phone call. But we absolutely must have prior information to refer to, such as a brief presentation similar to what we’ve described in this article — so we know what the client is talking about. Plus, it’s helpful for our project managers to have something to review before writing a SOW, or statement of work, which dictates the direction of the project. Don’t ask for a quote without providing sufficient details. We simply won’t be able to give you a cost estimate without a reasonable amount of information about what you want us to design. Don’t present your idea over the phone without any supplementary visuals. People have tried to talk to us on the phone and explain their idea without any tangible information or a presentation. This doesn’t work. We need something to work from in order to start your project. Email us some visuals and then we can set up a meeting. Don’t make the product idea too broad or tell the design company to just pick any design or aesthetic direction. Telling your design company to “just present some designs” doesn’t give us enough guidelines to determine how to create an effective design that will solve a problem. If we were to come up with 10 ideas, none of which you liked, you’d be wasting your own time and money. Your idea has to have some sort of constraints.